What Are Prebiotics Health Benefits And Food Sources? Probiotics are your gut’s best defense in the underworld of the microbiome. They’re the “good” bacteria that fight off inflammation and disease and boost your immunity. But have you heard of prebiotics? Prebiotics are non-digestible fiber compounds or carbohydrates that help feed the probiotics and help them grow. Think of them as the water and sunlight flowers and plants need to flourish. There are plenty of excellent ways to get prebiotics — you might already be eating them — garlic is one! Today, I’m breaking down how prebiotics and probiotics work together to help you stay healthy and keep your immune system strong. I’ll also share how taking a daily probiotic supports many essential bodily functions, including healthy digestion. It takes a village to keep your gut healthy and help it carry out its many important bodily functions, from sleep to digestion to weight management. Studies have shown that gut health is directly tied to type 2 diabetes, heart disease, metabolic syndrome and obesity. (1) Probiotics have been proven to help prevent age-related disease (2), but now a new body of research shows that getting enough prebiotics in your diet is just as important as eating probiotic-rich foods. You’ll mostly find fermented buckwheat in sourdough bread, but it’s also in some grain alcohols. Fermented buckwheat has been shown to help deliver good bacteria to the gut flora. A 2013 study found that when buckwheat and oat bran were combined with probiotic-enriched milk, the good bacteria were enhanced and their survival rate improved. (10) Enjoy some sourdough toast with a creamy chive cashew cheese and some sauteed asparagus. The prebiotic fiber from asparagus will help carry over good bacteria from the buckwheat in sourdough bread to your gut. Saurkraut, kimchi, pickles and other pickled veggies are good sources of probiotics. Just make sure you buy cukes that are brined in vinegar and salt because those will have active cultures. Or, you can make them at home with my recipe. By adding pickled veggies to your grain bowl, you reap the synbiotic benefits of probiotics and prebiotics. The fiber-rich vegetables and whole grains in your salad offer prebiotics that supports and promotes the probiotics in the pickles, kimchi and other pickled veggies. 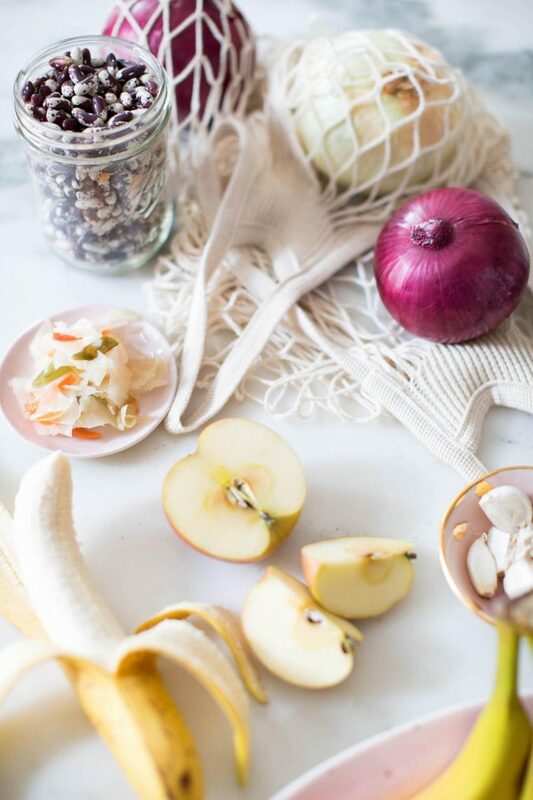 In addition to improving your digestion and protecting your gut, here are some other ways prebiotics and probiotics work together to improve your overall health. Studies show that the microbiome influences your circadian rhythm, your body’s internal clock, and a diet rich in probiotics may help improve the quality of your sleep. 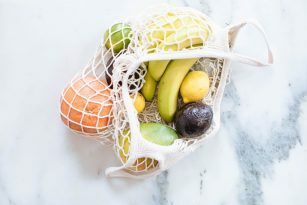 (4) By nourishing your microbiome with sleep-boosting nutrients, like potassium, magnesium and omega-3 fatty acids, chances are you’ll snooze a lot better at night. Prebiotic foods are excellent sources of these key sleep nutrients and help regulate your blood sugar levels so you don’t develop insulin resistance. And because your mood is directly linked to your gut health (5), prebiotics also work to help reduce stress and relieve depression and anxiety symptoms, which affect your sleep patterns. Like a bad chain reaction, lack of sleep causes the hormone ghrelin to send signals to your brain that you need to eat more food and to stop burning calories. (6) This leads to storing energy as fat and gaining weight. But getting more quality sleep at night and reducing stress in your life can help increase your leptin levels, the hormone that signals to your brain that you’re full. Incorporating more fiber-rich prebiotic foods can help you feel fuller longer and keep your blood sugar levels stabilized. At the same time, consuming more probiotic foods can help you become more resistant to stress and help you maintain gut health, even when you’re not feeling your best. Prebiotic foods are excellent sources of magnesium, which has been shown to help improve your bone health. One study shows that when magnesium-based adhesives were applied for tendon-to-bone repair, it actually improved the healing process. (11) But now emerging research shows that probiotics, like Bifidobacterium longum, may help improve bone density, reduce bone loss and increase bone formation. (12) So when you combine prebiotic and probiotic foods in your diet, you’re not only safeguarding your health but your bones and joints, too. Most people who are eating the standard American diet aren’t getting an appropriate amount of probiotic-rich foods. Which is why taking a daily probiotic can be a great way to maintain a healthy microbiome. Unfortunately, there aren’t any government regulations on what actually goes into probiotic supplements and their labels, so do your homework as it is important to look at the strain. One of the probiotics I recommend most often for my clients who need a digestive health boost is Align Extra Strength Probiotic (which contains 5x more good bacteria than Align Probiotic). Only Align contains Bifidobacterium 35624TM which helps promote and support a healthy digestive system* by fortifying your digestive system with a unique healthy bacteria 24/7 with continued daily use, which helps maintain a healthy microbiome balance and it can easily be incorporated into your daily routine and taken once a day. Win, win, win! There are a variety of probiotics out there for different needs, whether it’s for aiding digestion or treating a recurring infection. Then, you want to look at how many live cultures or organisms are in the supplement. If it says it’s “viable until the date of manufacture,” then chances are the microbes are dead by the time you take them. Lastly, you want to keep in mind how the probiotics should be stored; some require refrigeration while others are shelf stabilized. Note that there are also synbiotics, which are a combination of probiotics and prebiotics. Do you suffer from digestive health issues? What are they, and what are you doing to help treat them? Do you take a probiotic? Share them with the NS community below, and post your gut-friendly meals on Instagram with #nutritionstripped! If you’d like to get more personalized advice on how to address your gut issues, consider signing up for our nutrition counseling program. You’ll receive a full nutrition assessment with a customized plan to address your goals and dietary needs. Fortify your digestive system with healthy bacteria.